To define project resources, click Tools > Manage Resources… from the menu bar. The Project Resources window opens. To define resources via Excel, see Adding and Modifying Resources via Excel. The Resource Properties window opens, offering several resource fields. The Properties section is where basic settings are changed. The name is a description of the resource. If cost-loading the schedule, enter a name like Budget or Cost. This field is required. The category describes the type of resource. All categories have the same functionality in NetPoint, but they export to external software with different functionality. To choose a category, click the down arrow button to display a dropdown menu. If cost-loading the schedule, choose Cost. Cost/unit is the cost of the resource per unit of resource. This field is not currently used in NetPoint, but can be used when exporting to Excel. If cost-loading the schedule, enter the cost as 1. This field is required. The Displays section contains aesthetic properties that can be turned on or off. Control is achieved via the dropdown. Plot refers to whether or not the resource will be displayed in the profile at the bottom of the schedule. 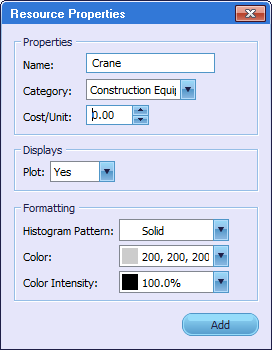 This setting may also be changed directly from the Project Resources window under the plot column by checking or un-checking the boxes next to the desired resources. The Formatting tab contains aesthetic properties that are not strictly on/off controls, like colors. A pattern can be added to differentiate between resources. By default, resources display as solid colors. Click the down arrow button next to Histogram Pattern to display a dropdown menu and then click to select the desired pattern. This is very effective for distinguishing between different resources. This field represents the color of the resource in the histogram. By default, it will be gray, but choosing a unique color is recommended. To change a color, click the down arrow button anywhere the Color field shows up and choose from the list. Any colors already used in the schedule will appear. To choose from a palette or define a custom color, select More. After clicking More, the custom color palette window will open. To create a custom color, click in the rainbow color area; the selected color displays below in the Color/Solid box. To select a darker or lighter tone, move the arrow up and down along the vertical slider bar to the right. Click the Add to Custom Colors button. 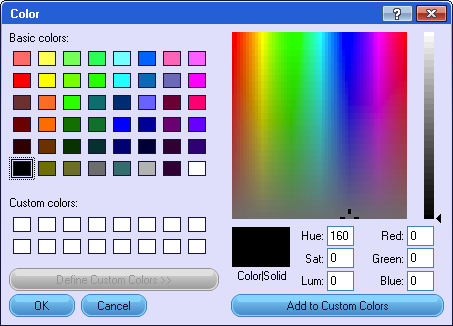 The new color displays in the Custom Colors area and is ready to be selected just the same as the basic colors above. Click OK to apply the color and exit the function. Once chosen for the first time, any basic or custom color will be displayed in the dropdown list for future selections. This number represents the darkness of the histogram bars. Click the down arrow button to display a dropdown menu of percentages. After entering the fields, click the Add button. The new resource will be added to the Project Resources window and the Resource Properties window will reset. Additional resources may be defined consecutively by repeating the steps above. When finished, click the Exit icon to close the Resource Properties window. NOTE: The Add button must be clicked each time to define a resource before clicking the Exit icon . Otherwise, the resource will not be saved to the list of Project Resources.